This is another 'healthier' dish that I really like. You can make it with almost any mild white fish but we chose catfish this time since it looked fresh at the store and it wasn't too expensive. 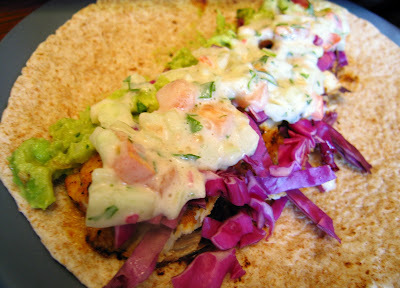 The first time I had fish tacos was out in L.A. and I've loved them ever since. The first ones I had had breaded and crispy fish, shredded cabbage and a tangy, creamy sauce. I decided to try and replicate this sauce by making a tomato, cucumber slaw with lime juice, fresh cilantro and mayo. I was pretty happy with the results. I have no idea how close I actually was to what I originally tasted out west. 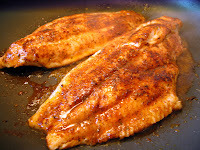 I usually bread my fish fillets in breadcrumbs and chef prudhomme's blackened redfish magic and saute them until they are crispy but this time I decided to avoid the breadcrumbs, flour and egg whites and just use the redfish magic spices and saute it in sesame oil and lime juice. I find that sesame oil is perfect for cooking fish in terms of the flavor it imparts and it takes high heat very well for blackening. 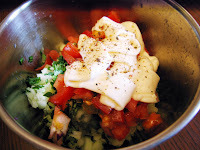 For the sauce I simply mix up the tomato, cucumber a lime's worth of lime juice and some light mayo and black pepper. In the end you have a filling and satisfying meal that really isn't too bad for you. You could probably even cut out the mayo to make it healthier but I think it gives the sauce a nice consistency. I am really diggin' these tacos! Healthy and delicious. Tacos, definitely a favorite of mine. Never tried the fish variety, however your fantastic display has moved me to do so pronto!